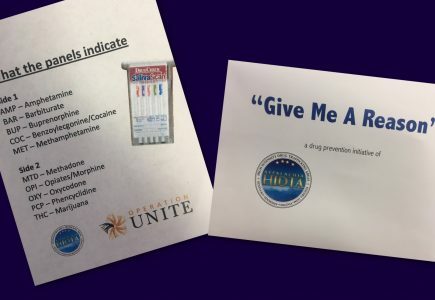 “Give Me A Reason” will provide free saliva-based drug testing kits to parents or caregivers. The non-invasive test is then given within the privacy of your home with results in approximately 10 minutes. PICK UP YOUR TEST AT THE BROOKE COUNTY HEALTH DEPARTMENT. NO PERSONAL DATA WILL BE COLLECTED, ALL TESTS ARE ADMINISTERED CONFIDENTIALLY WITHIN YOUR FAMILY.